We spent last week in Budapest, Hungary, and it was great. Budapest is like a budget version of Vienna, where all of the buildings are just as gorgeous but slightly abandoned and with just enough wabi-sabi that you feel like you're the first one to ever find them. Highlights of the trip included a lot of amazing Hungarian food (who knew?!) and some crazy 'acquired taste' kind of cocktails. My favourite food we tried was a chilled plum soup served with marzipan shavings and toasted cinnamon crumble, and the best drinks we had were apricot palinka (a grappa-type brandy) and Unicum Szilva, a bitter cordial aged in oak barrels lined with dried plums. Notice a theme? I think the reason I was so in love with the fruits, desserts, sweets and drinks in Hungary is because it just so happens that the fruits that grow best there are all stone fruits- my favourite kind. So when I got back to Edinburgh, the first order of business was making a cake inspired by all the amazing fruit I had in Budapest. But, well, just when you thought I had officially gotten past the rubbish recipes in the Box, here we are with this cake. It's not a terrible cake. The crumb was silky soft, which went nicely with the smooth, intensely fruity/chocolatey flavour of the frosting. The issue is more that I don't think either the cake or the frosting were supposed to have those textures. Let's start at the beginning, shall we? In an effort to use up all the 'ingredients' in my pantry (you know, things like 'half a bag of cashews from making homemade cashew butter a month ago' or 'a handful of dried cherries leftover from some trail mix I made for our last long-haul flight'), I've been searching out weird recipes from the box and from my own cookbook collection. Last week this resulted in a massive success when I riffed on a Julia Child recipe to end up with a shallot, broccoli and roquefort quiche that used up my leftover frozen broccoli from this dip, some shallots about to go bad and the tiniest rind of roquefort that would otherwise have gotten... well, even stinkier in my fridge. This week, it didn't. This time I had half of a bag of dried plums (read: prunes) that I bought for a recipe or cocktail or jam or something ages ago and was looking for a way to use them when I remembered a recipe for Chocolate Prune Cake with Prune Frosting in the Box. 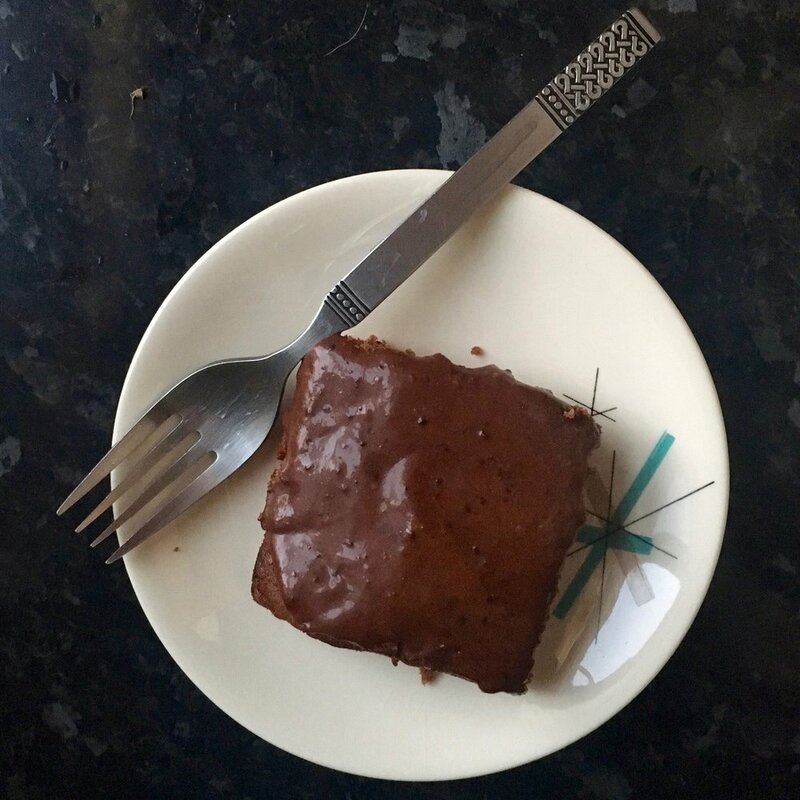 While they're not typical ingredients in many recipes these days, prunes have a decadent, sticky flavour like a date mixed with dried cherries, and I was excited to see how they'd taste in a chocolate cake. First issue: the recipe (for both the sponge and the frosting) called for strained prunes, something I didn't have, didn't know where to get and definitely had never tasted before to be able to attempt to make my own. 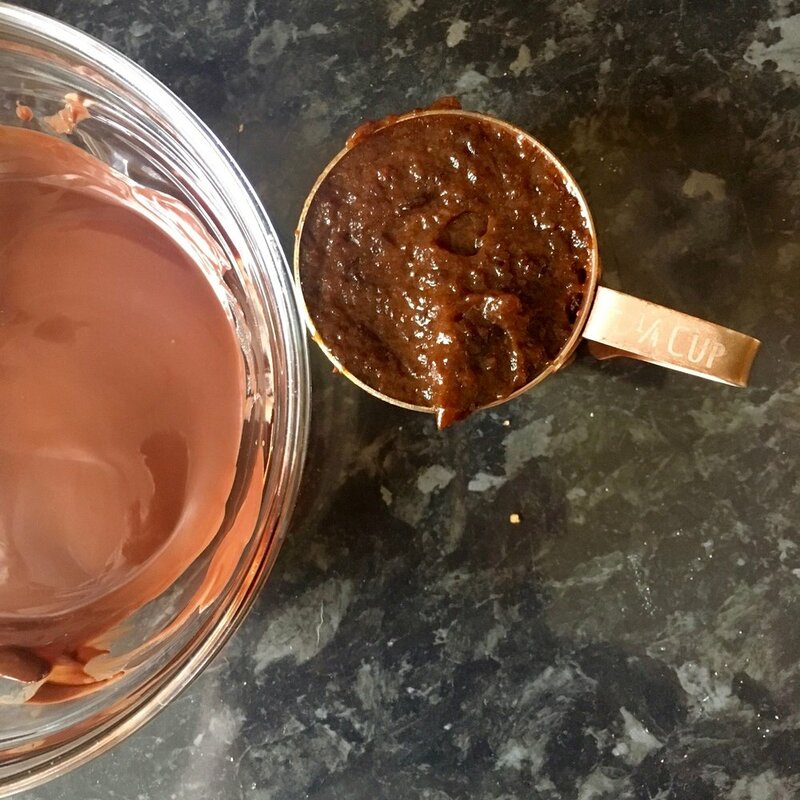 So MY first step in making this was to make my own strained prunes...which I did by soaking the prunes in 1 part boiling water/1 part brandy until they were plump and soft, then blending the whole thing (liquid and all) in the food processor until it was smooth. Super boozy and fruity, the mixture turned out to be great spread on toast and we've been eating it like jam for breakfast the last few days. But the flavour of the prunes didn't carry over into the cake- instead, it just tasted like Chocolate Raisin Cake and have we discussed before how much I hate raisins? I'm pretty sad about how this turned out, though I have a suspicion that the texture would have been perfect for rolling up to make a Swiss Roll, something that's been on my baking phobias list for ages... so maybe this will be the earliest version of a successful Swiss Roll yet to come. 3 spoons out of five. It wasn't an awful cake. If you like the taste of chocolate and raisins, you'd love this. But for me, it just didn't hit the spot. Those strained prunes, though? They're the jam, literally. Line a 13x9-inch pan on bottom with paper, then set aside. Cream shortening and sugar until light and fluffy, then add egg yolks and beat well. Add prunes, cooled chocolate and vanilla and beat on low speed for 45 seconds. Sift together dry ingredients, then add these to the chocolate mixture alternately with water. Beat until smooth, then fold in egg whites. Bake 12-15 minutes until a pick inserted in the middle comes out clean. Cool completely, then frost and decorate with walnuts. In saucepan, mix sugar, prunes, chocolate, butter, milk and salt. Bring to a boil and cook until a small amount of mixture forms a soft ball when dropped into very cold water. Remove from heat, add vanilla extract, allow to cool then beat well before frosting cake.